Deploying sensor networks in the built environment is not enough to produce smart buildings. How can we avoid creating silos of application-specific sensor networks? How can we publish the sensor data in secure, reusable and flexible ways? Can we support end-to-end provisioning of these sensor networks as an integral part of the building from requirements collection through design, procurement, construction, commissioning and facilities management operations? The Facilities Management (FM) subgroup of the NEMBES (Networked Embedded Systems) project aims to answer these questions and more by bringing together a multidisciplinary team of architects, civil engineers, computer scientists and electronic engineers, who are addressing the issue of networked embedded sensor systems in a holistic way across the stack from chip design, networking, middleware and service management. This four-year project started in October 2007 and is funded by the Irish Government's Higher Education Authority under the Program for Research in Third Level Institutions program. The project is led by the Centre for Adaptive Wireless Systems, and the FM subgroup is led by the Informatics Research Unit for Sustainable Engineering (IRUSE). Figure 1: The NEMBES project. Traditionally, facilities management in the AEC (Architecture Engineering and Construction) domain is concerned with infrastructural facilities management (eg security and emergency management or space management) and technical facilities management (eg energy management, buildings operation and maintenance). Within NEMBES-FM we are extending the application of sensors in smart buildings with additional sensing capabilities and sensor-centric applications for these areas. 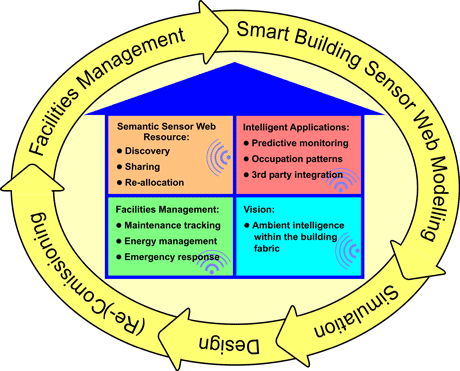 However, rather than building application-specific sensor networks and ending up with isolated silos of non-interoperable and inflexible sensor networks, the project has adopted a semantic Sensor Web design to give a Web-based, open distributed system of sensor resources within the building. This enables resource sharing, resource reallocation, sensor network interoperability, sensor discovery and intelligent applications that discover and reason over associations, for example between events in space and time or within a particular context. This is accomplished through the application of semantic Sensor Web technology such as SensorML (to describe sensor deployments and capabilities) developed by the OpenGS consortium, and standard W3C Semantic Web technology such as metadata definitions encoded as RDF (resource description framework) documents. This means adding formal semantic annotations to existing standard Sensor Web languages in order to provide semantic descriptions and enhanced access to sensor data. This is accomplished with model references to ontology concepts that provide more expressive descriptions of and relationships between concepts. The use of formal metadata to describe the sensors' outputs, platforms, locations and control parameters will enable a new generation of flexible facilities management applications to be built. Efficient and flexible management of disparate, decentralized information sources such as sensor data, building occupancy graphs, facilities management process models and building information models will enable smart FM applications for buildings with multiple occupying organizations and a distribution of facilities management authority across different management roles. The long-term vision of the group is to enable ambient intelligence within the smart building. In this scenario, building information models combined with location-sensing technology will allow the distribution of context-specific data to facilitate the monitoring of maintenance activity progress, ie the 'ambient interaction' of inspection and maintenance personnel with the fabric of the building itself. Examples of the benefits of this technology will include assisting facilities management staff with automatic monitoring and support of health and safety routine procedures; avoiding illegal occupation density in public spaces by triggering security personnel actions; and more effective facility space and relocation management via automatic inventory item tracking. Smart infrastructural FM applications that easily integrate new personnel, inventory items, sensors and use-cases without the intervention of dedicated IT personnel, will instead have these tasks performed by FM personnel and their delegates within the organizations occupying the building. They will additionally support seamless process integration between local FM activities and external third parties such as contract maintenance engineers, visitors, short-term occupants (eg conference organizers) and security or emergency response teams. This project also goes beyond traditional ICT standardization to embrace the major AEC domain IT standards such as the IFC (Industry Foundation Classes), used for describing models of buildings in CAD tools and AEC construction requirements and project management tools. Integrating our work with the IFC standards will enable a dialogue with the ACE domain experts, thereby encouraging rapid integration of semantic Sensor Web technology in ACE tools and business practices. The project consortium is fortunate to include the Environmental Research Institute at UCC, a live smart building, in which sensor networks and building information models are combined with Semantic Web technology to provide a unique testbed.